Discussion in 'iPhone and iPad Games' started by TouchArcade Bot, Jan 13, 2015. 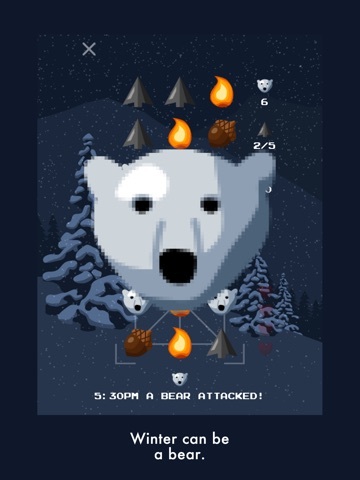 "Bear Winter might be the most romantic Match-3 game I’ve ever played." 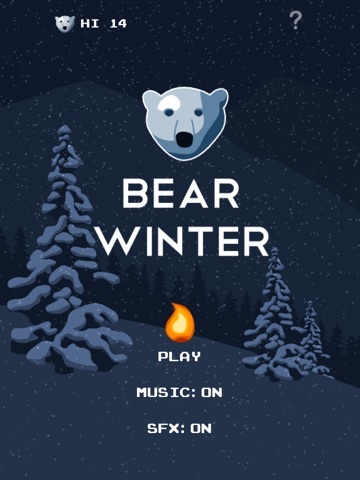 - Gamezebo "Bear Winter's tranquil piano soundtrack and lazy snowfall backdrop barely shield a merciless survival game." - Pocket Gamer "7/10" -Pocket Gamer, Bronze Award I travel, alone, deep into the wilderness to find her. I find fires to stay warm. I gather acorns to refill my health. I collect arrows to be ready. Then the ice bears come. 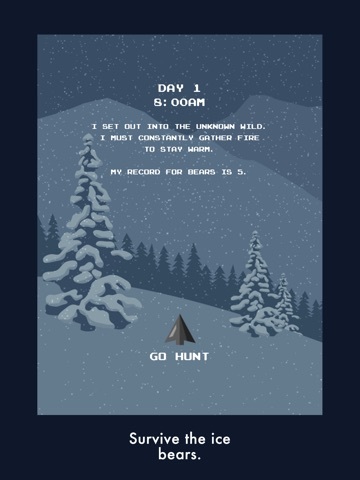 - Visit the wilderness via beautiful pseudo-retro graphics - Haunting, gorgeous soundtrack - Addictive bite-sized gameplay - Enthralling story - Original matching mechanic -- not a "match-three" clone - Challenging strategy -- each item performs a different function - How many days can you survive? Nice little free game.....I'd change the icon. Been thinking of ways to vary it up just a little. Agreed. 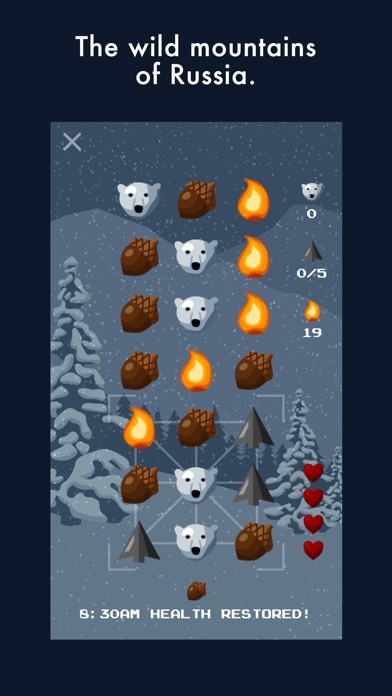 It has a unique theme, challenging gameplay, and polished graphics and sound. The only issue (for me and probably high score chasers) is the pay model. Coins can be bought via IAP which allow you to continue (up to 3 times) after death. Ads can be watched for coins as well. 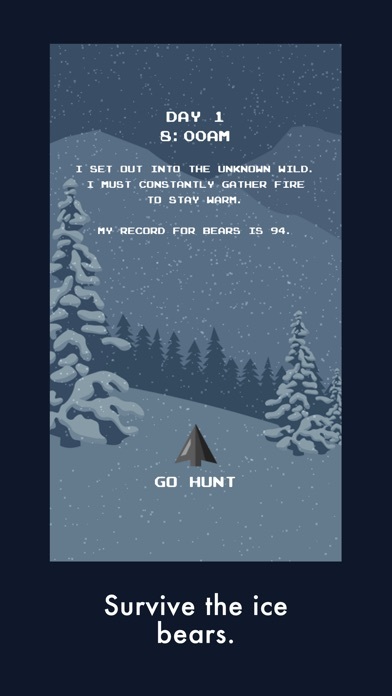 For a game about stark survival that tracks scores via GC, it seems a little off to use this mechanic. Otherwise, the game is definitely worthwhile and recommended. Difficult, I can't get through Day 2. But emotional and engrossing in an odd way. Minimalist. I love this game but as Guise posted: what a shame that the game makes the leaderboards somewhat meaningless with it's "pay to win" approach to monetization. I would have preferred to have paid a couple of dollars for it and there to be no continues or at least no way to earn coins except through play. 1. You can only continue up to three times on a single game, significantly limiting the impact of purchased coins on top scores. 2. 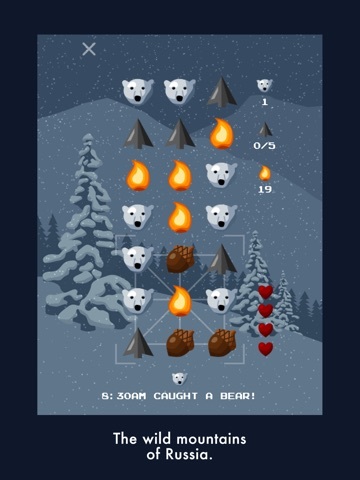 Once you get good at the game, you can earn enough coins for a continue in just a game or two by collecting bears. Several of our testers reached the highest scores without ever buying coins. I'll be sure to check out that thread. Feel free to post my response, and we'd appreciate any more feedback you have on our thought process here. Thanks! That seems like a very reasonable explanation to me and I would certainly support that "remove coins" IAP if they implement it. I do enjoy this game but have yet to finish even day 2. Seems the difficulty isn't quite scaled well. Try to think a move or two ahead and you should make it past day two with too much trouble. 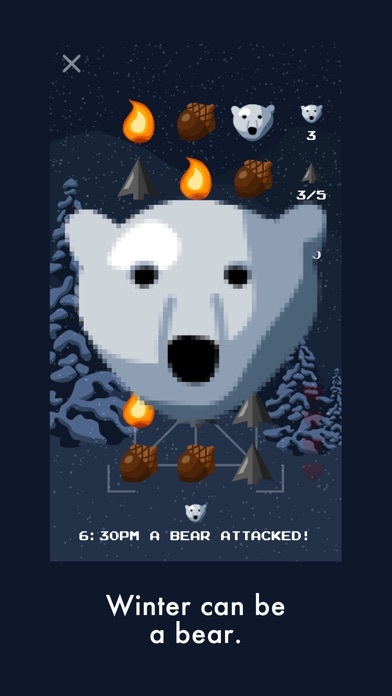 My best is 5 days and 55 bears. Yeah, I realized after writing my post that the 3 continue limit does balance the 'pay to win' aspect a bit. And I definitely think the developers had good intentions with the pay model. I'd pay for the "full version" mentioned even after buying a small IAP to support the developer. Again, the game is certainly worthwhile and recommended as is. The real compromise in the game, per the continues, is that it seems a bit silly to have both hearts and lives. It would be better to have one or the other but not both. Still, no matter: this is an excellent game. FYI they removed all of the f2p elements and it's now full premium. Beautiful, engaging game! Nice job. Currently free! Pick it up now!